From 1952 to 1960 THE GOON SHOW spawned a cult of quick-fire humour as radio's most influential clowns. Driven by an inspired lunacy they wrenched conventional comedy into a new era, a forerunner to Monty Python. For the BBC's 50th Anniversary in 1972, the archives delivered three coffins before a distinguished audience at the Camden Theatre in London. They contained three legends of entertainment history. SPIKE MILLIGAN - the well known typing error, script writer and voice of Eccles, Moriarty, Little Jim and Minnie Barrister. PETER SELLERS - alias Major Bloodnok, Bluebottle and Henry Crun, practising his comeback by whistling from Hamlet. HARRY SECOMBE - bold, toothless, Welsh and weighing in at thirty-seven stone. Also the brains and brawn behind Neddy Seagoon, dressed in a floral cretonne frock as the Goons take their final bow in this - their last performance after twelve years of silence. This rare performance is a lasting tribute to their genius, demonstrating the combined manic brilliance of Milligan, Sellers and Seacombe is as fresh and funny as yesterday. Goon, but by no means forgotten! 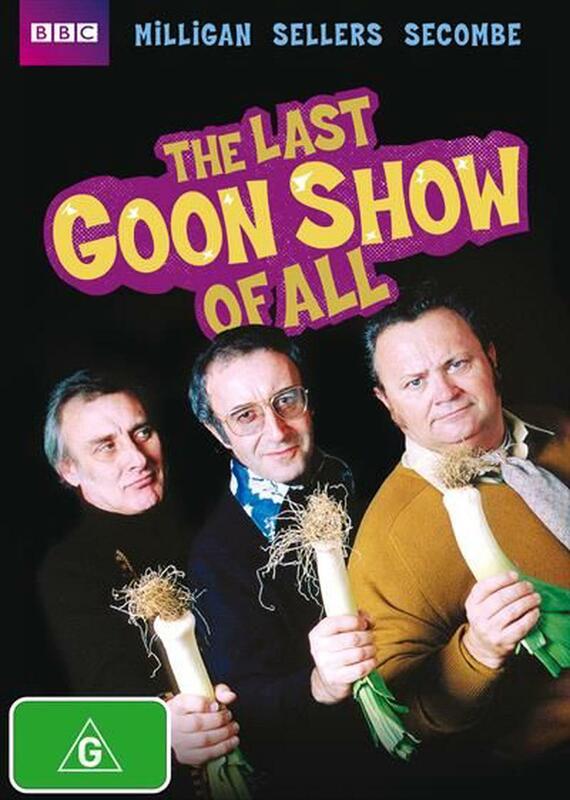 The last ever performance of the crazy comic trio recorded for the BBC's 50th Anniversary.